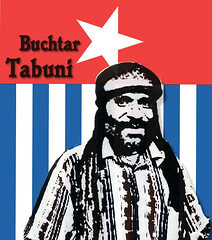 Buchtar Tabuni, the Chairman of the pro-independence National Parliament of West Papua, was released unexpectedly from Abepura prison around 12pm West Papua time today, to a waiting group of about fifty of his supporters from the West Papua National Committee (KNPB), according to multiple sources. KNPB News reported that Tabuni sent an SMS message early this morning from prison. “To all the Free Papua fighters in Numbay, Sentani and its vicinity, at 9 this morning please pickup (at) Abepura LP”, Buchtar’s message read. Local sources today reported to West Papua Media that about fifty KNPB members then escorted a relieved Tabuni from Abepura prison on a long march to the assassination site of his friend and KNPB colleague, former KNPB Chairman Mako Tabuni. Mako Tabuni was gunned down in broad daylight in a political assassination carried out by Australian-funded and trained Detachment 88 counter-terror officers outside the Perumnas 3 Dormitories in Waena on June 14, 2012, one week after Buchtar’s arrest. He was also due to be taken to the graveside of Mako Tabuni in order to pay his respects to his slain friend, colleague and clansman. In recent months, Tabuni’s health had suffered from his incarceration in Abepura prison, with complaints of respiratory illness, gastric diseases and dangerously low blood pressure, from his incarceration in atrocious and unhygienic conditions by Indonesian colonial prison authorities. 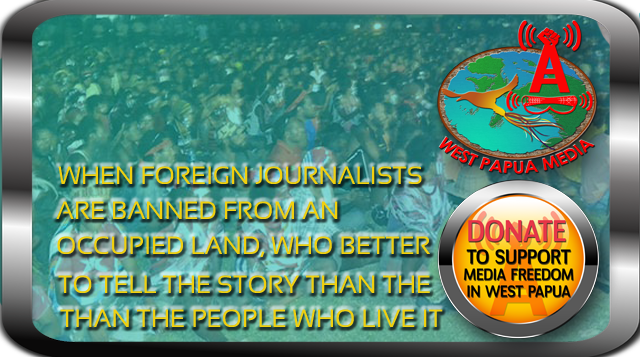 According to credible sources, Tabuni is spending the next days with family, friends and colleagues from KNPB to mourn the losses of his comrades, and to discuss and consider the next steps in the campaign for justice in West Papua.